This 1964 Corvette is equipped with a Rolling Thunderz 327 cid small block Chevy engine produces over 500 horsepower with a production OEM engine block and production OEM cast iron cylinder heads. Rolling Thunderz are Cylinder Head modification specialists with proven results in delivering superior power and performance with Corvette cylinder heads. 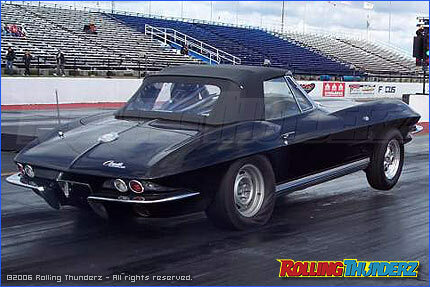 The Rolling Thunderz built 327 small block Chevy engine produces enough power to pull the front wheels off the ground in this 1964 Corvette which runs 11 second elapsed times in the quarter mile at 118 mph.